Regarding our new IEG open access publication “On site, in time” here is Sarah Panter’s article on St. Louis, in which she focuses on German revolutionaries and aboltion. St. Louis, which was originally founded in 1763 as a French trading post, grew into a centre of European immigration from the 1830s and became a hub for settlers in the American West. The city’s favourable location on the Mississippi River earned it the name “Gateway to the West”. The Missouri territory, however, was not acquired by the United States from France (“Louisiana Purchase”) until 1803. Under the so-called Missouri Compromise, the area was included in the Union in 1821 as a state where slavery was legal. Still, unlike many Southern states, Missouri had only few slaves. The key role of St. Louis as a stronghold of secular “abolitionism” was already apparent in the early stages of the American Civil War (1861–1865). 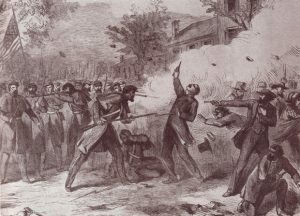 On May 10th, 1861, tensions developed at Camp Jackson between pro-Union and pro-Confederate militias regarding the nearby St. Louis Arsenal, which belonged to federal troops. In the ranks of the pro-Union militia there were many German immigrants. By contrast, along with governor of Missouri Claiborne Fox Jackson (1806–1862) and the local slaveholders, most Irish immigrants supported the Confederate camp. When shots were fired during this dispute, turmoil ensued and anti-German insults followed. In the end, there were 30 deaths. The Union militias were finally able to successfully defend the armoury, and Missouri remained part of the Union. At the same time, however, the incidents led to deep divisions among the population. In Missouri and other German-American strongholds of the northern states, many former participants in the German Revolutions of 1848/49 such as Friedrich Hecker (1811–1881), Karl Schurz (1829–1906) or Franz Sigel (1824–1902) recruited and commanded German volunteer regiments for the Union. This found popular expression, for example, in the Civil War song “I’m Going to Fight with Sigel”. Until the 1830s, mainly rural-agrarian immigrants came to Missouri. For them, religious practices and institutions played an important role in their daily life. While neither Lutherans nor Catholics necessarily actively supported slavery, they also did oppose the existing system. In contrast, from the end of the 1840s, European refugees fleeing after the defeat of the revolutions and immigrants who sympathized with the revolutionists’ social and political demands, especially those from southern Germany, settled in St. Louis. During this period, the city on the Mississippi was a growing centre of the Midwest: In 1850, almost 78,000 people lived there, including around 24,000 Germans. The revolutionary exiles, who quickly became the intellectual leaders of the German-Americans because of their popularity, frequently represented (radical) democratic, anticlerical and/or (early) socialist ideas. They not only rejected slavery and the existing slavery system, but sought to realize their European ideals in their new environment. Accordingly, they decided to participate in America’s “second fight for freedom”. A central figure of the thriving German public in St. Louis was the journalist, writer, and theatre director Heinrich Börnstein (1805–1892). Born into a confessionally mixed family in Hamburg, he mostly grew up in Catholic Galicia (Habsburg Monarchy). He arrived in New Orleans from Le Havre  in April 1849. From there he travelled, like many other immigrants, up the Mississippi river to St. Louis. Previously, he had spent time in Paris, where he published early writings from Karl Marx. Börnstein, who increasingly distanced himself from Marx, not only contributed to the growth of cultural life in St. Louis by promoting theatrical and musical performances. He also worked as an editor of one of the most influential German-language newspapers in the Midwest, the “Anzeiger des Westens”. In St. Louis, Börnstein focused on two demands that linked many refugees of the revolutions of 1848/1849. First, he was active in the fight against slavery; second, he called for restraining religious influence in public life. As consequence, Börnstein not only inflamed the long-established (ethnically German) Lutherans of Missouri, but also the Catholic population. In 1851, he had already conceived of a negative scenario for his conspiracy novel “Die Geheimnisse von St. Louis” (The Mysteries of St. Louis), in which he portrayed Missouri and the American South as a “protectorate of European Catholic powers”. Missouri and especially St. Louis developed into a radical centre of German immigration even more than other German-American strongholds in the Midwest (like Wisconsin or Illinois). Nowhere else did the revolutionary refugees from 1848/1849 strive as much to make their republican and cosmopolitan ideals part of public life and to implement them locally. Here, regional problems like slavery intermingled with the experiences of this group on the other side of the Atlantic. The fight for the abolition of slavery, where the struggle against the planter aristocracy was often interpreted as analogous to the struggle against the nobility in Europe, and calls for the restriction of religious influence in society, were always part of the larger debate about the legacy of the European revolutions. These immigrants were not always successful, however. Many ideals could not be realized and some revolutionary activists who had set sail for the United States with high hopes returned to Europe in the 1860s and 1870s in disappointment – including Heinrich Börnstein. He first settled in Bremen in 1862 as American consul, before finally making his way to Vienna. Kristen Layne Anderson, Abolitionizing Missouri. German Immigrants and Racial Ideology in Nineteenth-Century America, Baton Rouge, LA 2016. Heinrich Börnstein, Memoirs of a Nobody. The Missouri Years of an Austrian Radical, 1849–1866, St. Louis, MO 1997. Allison Clark Efford, German Immigrants, Race, and Citizenship in the Civil War Era, New York 2013. Misha Honeck, We Are the Revolutionists. German-Speaking Immigrants and American Abolitionists After 1848, Athens, GA 2011. Steven Rowan, Germans for a Free Missouri. Translations from the St. Louis Radical Press, 1857–1862, Columbia, MO 1983. ↑ John F. Poole, “I’m going to Fight Mit Sigel”. URL: http://jhir.library.jhu.edu/handle/1774.2/31873 (08.16.2016). ↑ See Robyn Burnett et al., German Settlement in Missouri. New Land, Old Ways, Columbia et al., MO 1996, p. 22. ↑ Fritz Anneke, Der zweite Freiheitskampf der Vereinigten Staaten von Nordamerika, Frankfurt/Main 1861. ↑ See passenger list of “Espindola,” available at: http://www.nausa.uni-oldenburg.de/1848/boernst.htm (08.16.2016). ↑ Heinrich Börnstein, Die Geheimnisse von St. Louis, Cassel 1851, p. 170. Sarah Panter, St. Louis, in: On site, in time. Negotiating differences in Europe, ed. for the Leibniz Institute of European History (IEG) by Joachim Berger, Irene Dingel and Johannes Paulmann, Mainz 2016. URL: http://en.ieg-differences.eu/on-site-in-time/sarah-panter-st-louis-mo, URN: urn:nbn:de:0159-20161103384. This entry was posted in Actualités / News, Posts and tagged Abolition, German Revolutionaries by Fabian Klose. Bookmark the permalink.